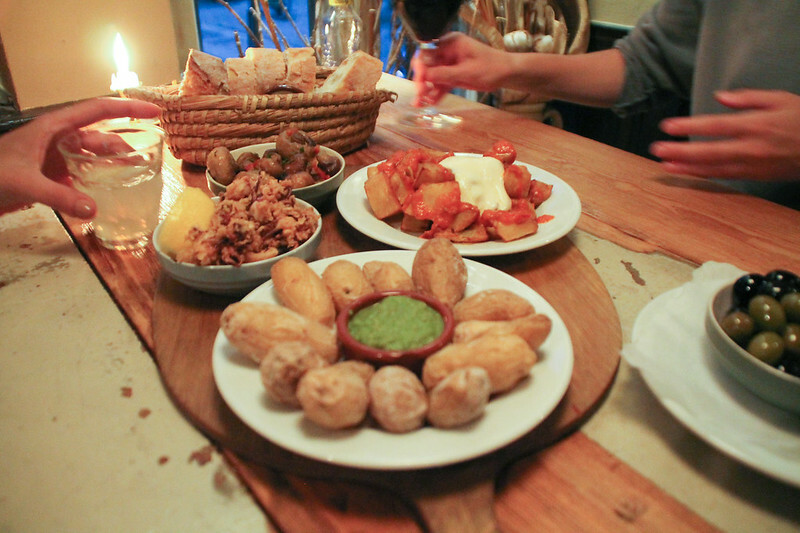 One thing that just screams summer holidays for me, is tapas. Sharing delicious food with friends, drinking red wine, talking and laughing for hours – that’s living the good life. 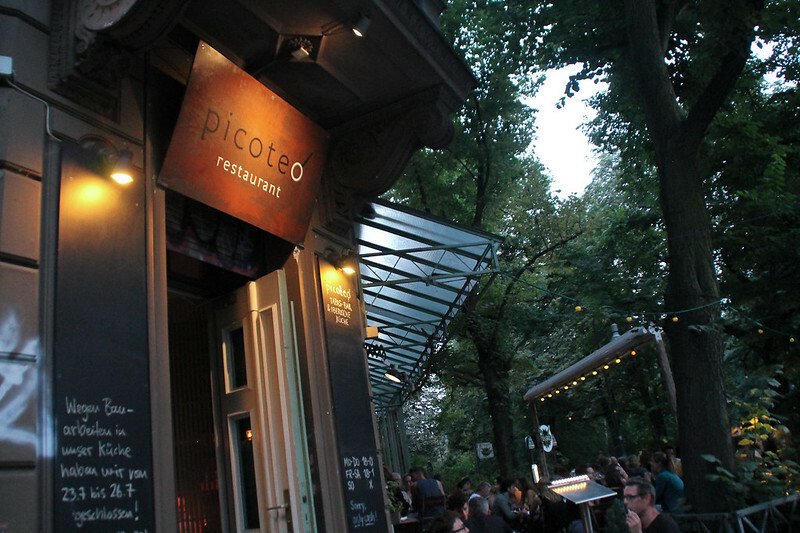 At Picoteo in Berlin-Kreuzberg, picky and non-picky eaters can enjoy all that together! Pic(k)oteo offers the best of Iberian cuisine: homemade Spanish and Portuguese tapas and of course, paella. There’s something for everybody on that menu: Vegan tapas, gluten-free tapas, vegetarian tapas… and the ones with fresh fish or meat. I was very tempted, but just not hungry enough to go for their vegan (!) paella for two. Next time, definitely. To show a bit of their variety, we ordered Pan con Alioli (bread with Alioli, a garlic sour cream I was addicted to as a kid), Champiñones al ajillo (roasted mushrooms in garlic), Papas bravas (potatoes with spicy tomato sauce and – surprise – Alioli), Papas arrugadas (potatoes with sea salt and green pepper sauce), Chipirones (fried baby calamari) and some mixed olives. It was the perfect amount for the three of us and so so good! The interior just adds to that summer holiday feeling. 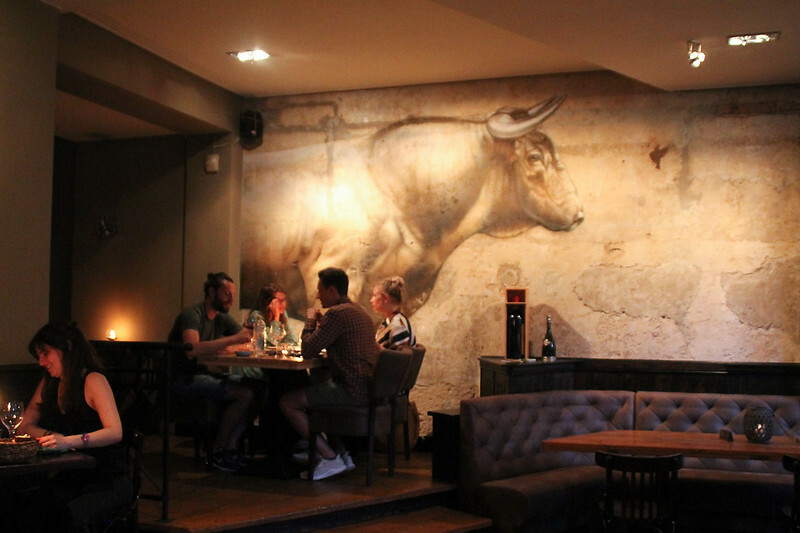 Dimmed light, stone walls with a bull painted on it – just like a modern, authentic tavern somewhere in Spain. When it’s warm outside like right now, you can sit in their small garden. Now imagine the waves crashing behind you… and it feels like Berlin’s at the sea. ON THE MENU: Homemade tapas and paella, salads and grilled fish & steaks. Spanish and Portuguese wine. PRICES: Tapas between 2.30 and 7.90. Paella for two people 24.90 (the vegan one only 19.90). VIBES: Feels like a comfy, modern Mediterranean tavern somewhere in Spain or Portugal. PICKY NOTES: Vegan, vegetarian & gluten-free tapas available. Vegan paella. Picoteo, Erkelenzdamm 47,10999 Berlin. Website.